One of the greatest concerns associated with breast augmentation and abdominoplasty (i.e. tummy tuck) is the post-surgical pain. 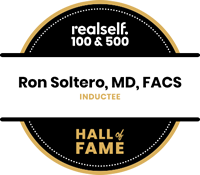 At RGS Plastic Surgery, Dr. Soltero has developed an innovative approach to help minimize the discomfort associated with these procedures. Marcaine: In breast augmentation, marcaine, a long-acting anesthetic agent, is infused into the pocket where the implant has been placed. This will help to numb the area for 10-12 hours after the operation. In the tummy tuck procedure, the fascia over the muscle is injected to decrease postoperative discomfort. Robaxin (Methocarbanol) is a muscle relaxant that has been shown in several publications to reduce postoperative discomfort after sub-muscular breast augmentation. This medication is taken by mouth every 6 hours for a period of 5 days, starting the day after surgery. Narcotics (pain killers): If the patient still has discomfort, she is also prescribed medications (e.g. Vicodin, Darvocet, Percocet) to help her cope with any breakthrough pain. 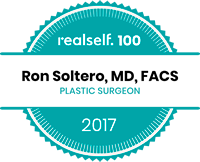 At RGS Plastic Surgery we perform a significant number of breast augmentations and tummy tucks every month. We have found that the combination of these 4 modalities helps take the fear out of these procedures, making the postoperative recovery nearly pain free. With this innovative approach, you no longer need to worry about extended recovery times and you can quickly get back to your normal routine. The pump is put in place by Dr. Soltero and provides continuous pain relief in those important first days after surgery. 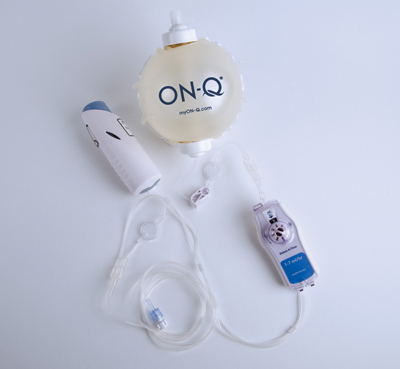 ON-Q is a small high-tech balloon that holds local anesthetic (a pain-numbing medication) and delivers it through a tiny specially-designed tube directly into the surgical incision site. The medication is delivered continuously and slowly for three to five days after surgery. ON-Q works automatically and keeps the incision site numb, thus reducing pain.